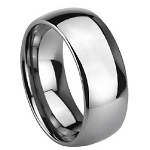 Want to enjoy the luxurious look of a platinum ring at the fraction of the price? Look no further than our cobalt chrome rings. 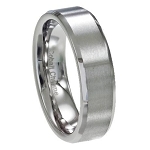 These wedding bands sit at an agreeable mid market weight and will shine no matter what the weather. 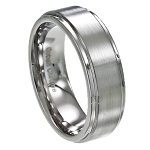 The lustrous alternative metal is hypoallergenic, making it the perfect choice for sensitive skins and is on trend for this season as the popularity of cobalt chrome wedding rings keeps on rising. Known for its likeness to platinum, we carry options for the most traditionalist design lovers, as well as the the most contemporary unique designs for a ring to last a lifetime. 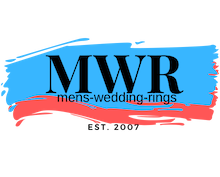 Our cobalt mens rings feature a natural shining silvery-white appearance, an ideal and more affordable option than platinum. 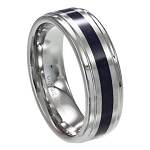 These mens rings offer superior shine and extreme durability in a classic white metal. A metallic mix of cobalt and chromium, the blend of metals allows our cobalt chrome rings to be tarnish and scratch resistant, as well as not having to worry about cracking. Our selection includes a vast array of finishes including polished, and edge polished, as well as a multitude of stylish and creative designs. Also known for being more durable than other sophisticated metals, these rings can stand the test of time without the telltale signs of wear and tear. Providing both hard wearing qualities and an attractive and chic design, our cobalt chrome rings prove that one doesn’t have to compromise the other. A ring with a finish that won’t fade over time, let us help you choose a definitive ring for your style and needs.